A combination of different metals like silver, mercury, tin and copper are used to make dental amalgam. Known collectively as “silver-colored fillings” they have been in use for more than a century simply because they cost less, and last much longer than gold fillings or other composites. Since silver colored fillings are very durable, they are often used to fill large cavities especially on molar teeth that are used for chewing. This type of amalgam is also able to dry quickly, allowing dentists to put them below the gum line or on areas that are difficult to keep dry. Amalgams can also be placed within a short amount of time; this makes it ideal for people with special needs and for children who find it difficult to stay still while the dentist performs a procedure. Despite these advantages, the amalgam has some glaring disadvantages. Since it does not look natural, it can easily be seen especially when placed on your front teeth. This can make some people feel ashamed. Placing the amalgam also requires the removal of more tooth structure than any other dental fillings. 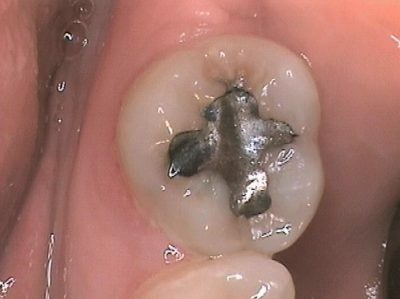 Is Dental Amalgam safe to use? Many people are concerned over the use of amalgam primarily because it contains mercury. But because its mercury content is combined together with other metals, it forms a stable and safe material. As a matter of fact, there are a lot of credible scientific studies that confirms the safety and effectiveness of amalgam when it comes to dealing with cavities. Institutions like the American Dental Association, U. S. Food and Drug Administration, U.S. Centers for Disease Control and Prevention, as well as the World Health Organization, all agree that the use of amalgam is both safe and effective for filling cavities based on extensive scientific studies. The National Multiple Sclerosis Society, Autism Society of America, American Academy of Pediatrics, and the Alzheimer’s Association also supports the fact that it poses no health risk. The Mayo Clinic, another credible authority in health, also states that amalgam is a safe choice for dental filling. They also added that there are different kinds of mercury, and the type of mercury found in the water that can be consumed by fish and can cause health issues in humans is not the same type of mercury that is being used in amalgam. The ADA does want continued research on all types of dental filling materials. They are also more than willing to inform the public should the government or the scientific community determines that any filling material is unsafe for use. The dentist’s priority is your health and safety, this is why the ADA recommends that you talk with your dentist about your dental filling options and about what’s right for your specific needs. You can visit the ADA fact page for more information.